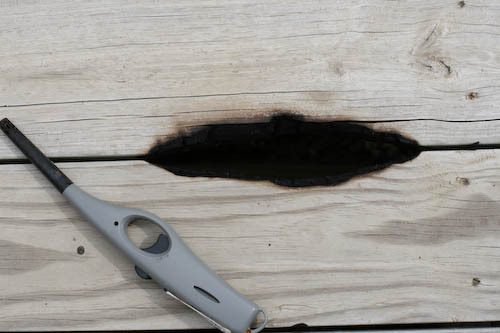 A few weeks ago I had a little grilling mishap – several hours after eating the deck was glowing. A small piece of charcoal had fallen out out of the bottom of the grill, bounced off the ash pan, and proceeded to smolder this hole all the way through the deck. Last night I replaced these two boards. I guess I’ll start closing the bottom of the grill from now on! METEORS! Quick, cast Knights of the Round Table!